I have an ADSL connection at home in Tata with only about 800kbit/s upload bandwidth. I had to figure out how I can prioritize VoIP traffic with my new RouterBoard 750GL. 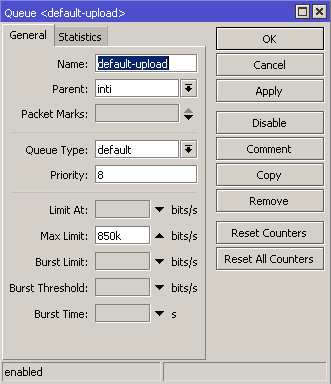 I’ve set the “default-upload” queue for the parent of each subqueue and set the packet marks to “prio1” for the queue with priority=1, “prio2” for the queue with priority=2 and so on. So for example the packets marked as “prio5” will go to the queue which matches packets marked as “prio5” and so they will have priority 5. I mainly followed the marking rules described here (look at the QoS Example section). By default, every outgoing packet is marked with “prio6”, and UDP packets are “prio2” (for VoIP QoS). I tested my configuration with iperf and speedtest.net.